The superintendent of a Missouri school district is offering an apology for the actions of some students that were caught on camera. 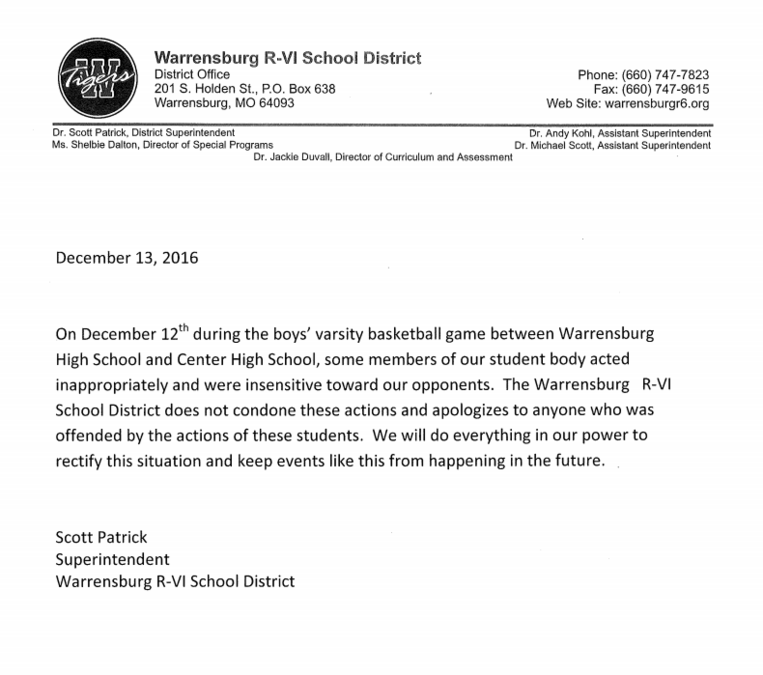 The Warrensburg High School boy’s basketball team was getting ready to tip off against visiting Center High School on Monday night, when some students turned their backs on the players as Center’s starting roster was announced. One of the students in the video held up a “TRUMP” campaign sign. Video of the incident spread quickly across Facebook, sparking a heated debate on whether the student’s actions crossed from unsportsmanlike to racism. The woman recording the video believes it was indeed racism. Some current Center High students weren't so sure the act was racially motivated. “It just seems like an immature thing to do. It seems like they are trying to piss us off. I don't think they are really trying to say anything other than that. Just seems like, I don't know a way to aggravate us,” said one student. Nunn said some Warrensburg students reached out to her on Facebook to offer apologies. Dr. Patrick, the superintendent issued a statement Tuesday and says he called his Center School District counterparts to say sorry for the incident. “I was disturbed by the video. It was obviously inappropriate conduct on the behalf of a small number of our students. So that upset me. From the very beginning, we regretted that it happened and I apologize on behalf of our students and our school for the incident,” said Dr. Patrick.